The day your new wine cooler arrives in the mail is special day. It’s brand new, untouched, and you get to use it for the first time. Loading in the bottles one by one you have the comfort of knowing that they’re going to be kept at their optimum temperatures. And as long as your cooler is plugged in, your prized wines will be well-preserved. You want to make sure that the cooler you’re entrusting your wines with is worthy of the precious bottles you keep inside. 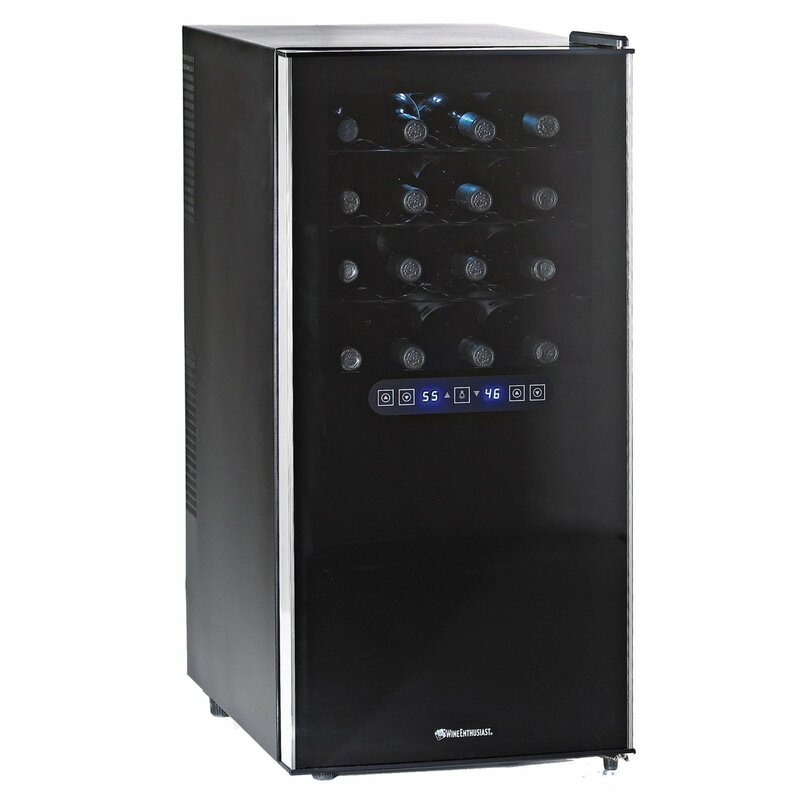 There are innumerable options for different wine coolers to choose from. Many of them are quite good, but for those who want to quickly and easily choose the best one, we’ve narrowed it all down to this list of the top eight for 2019. In order to figure out exactly which cooler to buy, you should first figure out what features you would like. There are several factors to consider, as not all wine coolers are created equal. We picked our top eight based on the following criteria. You should figure out which features you value most and base your decision on that. Also, you ought to decide where you’ll be placing your cooler, as this will also play a major role in which one you should pick. If you need something that can fit in a relatively narrow space, then you’ll want one that fits three or so bottles horizontally and several more vertically. If you need something you can put on your countertop, then a more square or horizontally orientated shape might be better. This is, of course, a matter of preference though. Probably most important will be your cooler’s capacity. If you have a large collection, you might want to get something that can hold all of your bottles and then some, in case your collection expands. You can always finish some bottles off to make room for others, but for aging various wines, more space is better than not enough. You can, however, buy an additional unit later if you need to, but it’s better to plan ahead. Ready to find out which ones are best? Here they are, the best of the best for 2019. 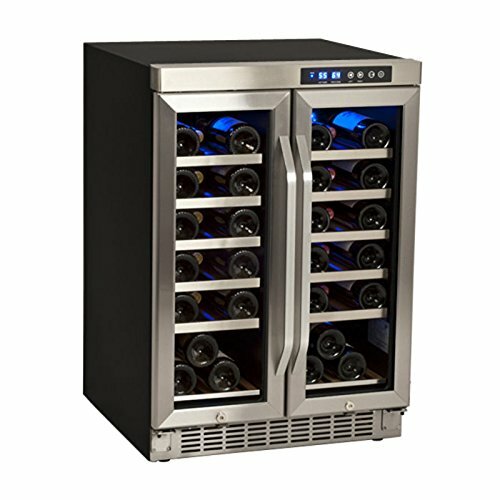 This gorgeous appliance is the top selling built-in wine cooler on Amazon, and it’s also our pick for number one. It has a sleek stainless steel door frame and handle that easily go with any other kitchen décor. It features removable wooden shelves and an interior LED light so you can see your bottles more easily. 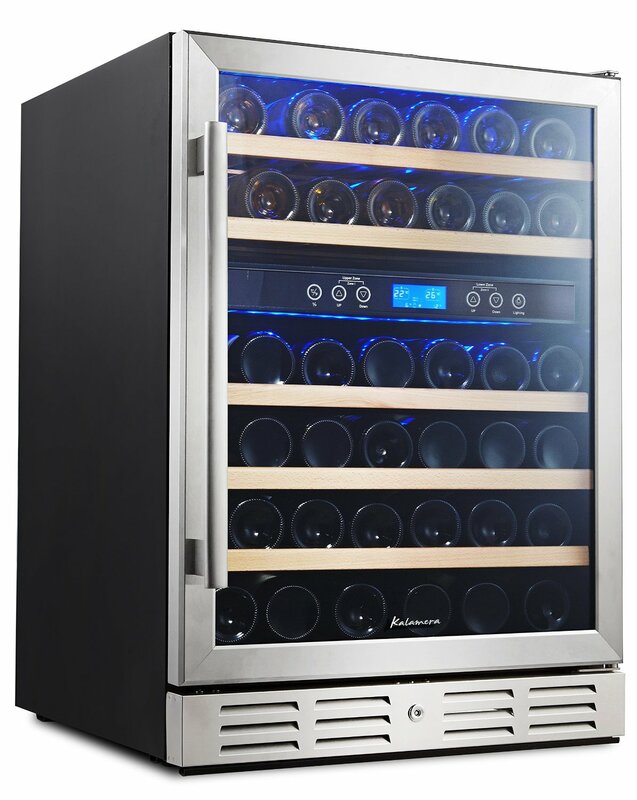 The Kalamera 46-bottle wine cooler uses a compressor cooling system that actually runs very quietly. Many compressor cooling systems create an annoying sound when they switch on, but this cooler is very much unobtrusive. It has dual temperature zones that can easily be adjusted with the control panel. The upper zone produces temperatures between 40-50°F (4-10°C), while the lower zone ranges from 50-66°F (10-18.9°C). It’s a built-in cooler, so you can replace your trash compactor with this handsome appliance. Visitors to your home will ask about it, as it does attract attention. You can buy it for less than $800 from Amazon. 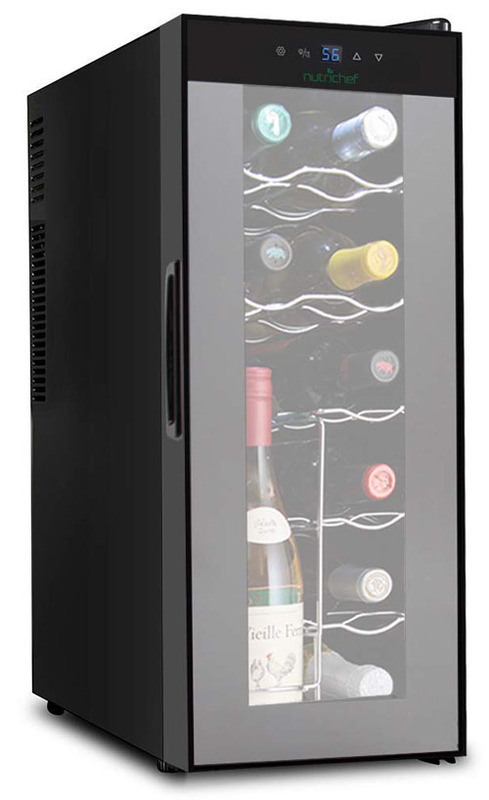 This 36-bottle Edgestar compressor wine cooler is just plain gorgeous. Covered in stainless steel, it has a very modern, quality look that would compliment any room. The French door layout with stainless steel-trimmed shelves gives it a unique design that anyone can appreciate. It is built-in or freestanding, and comes with a lock on each door. It costs about $890 and comes with a manufacturer’s warranty. 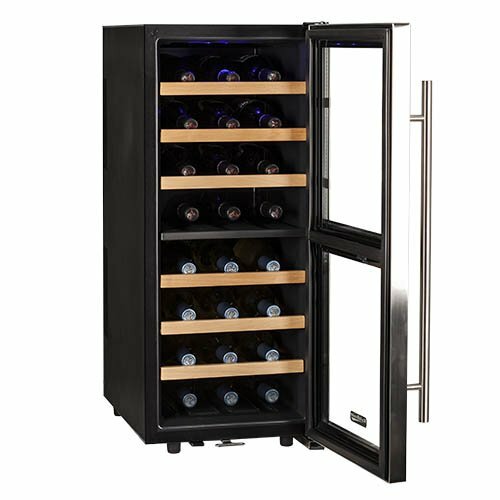 This sleek black wine cooler features a beautiful smoked glass door and nine removable chrome racks. It runs very quietly due to its vibration-free thermoelectric cooling system. Temperatures range from 46-66°F (7.8-18.9°C) for whites and 54-66°F (12.2-18.9°C) for reds. It’s slim and can fit neatly into tight spaces. At roughly $230 on Amazon, this wine cooler offers great value. 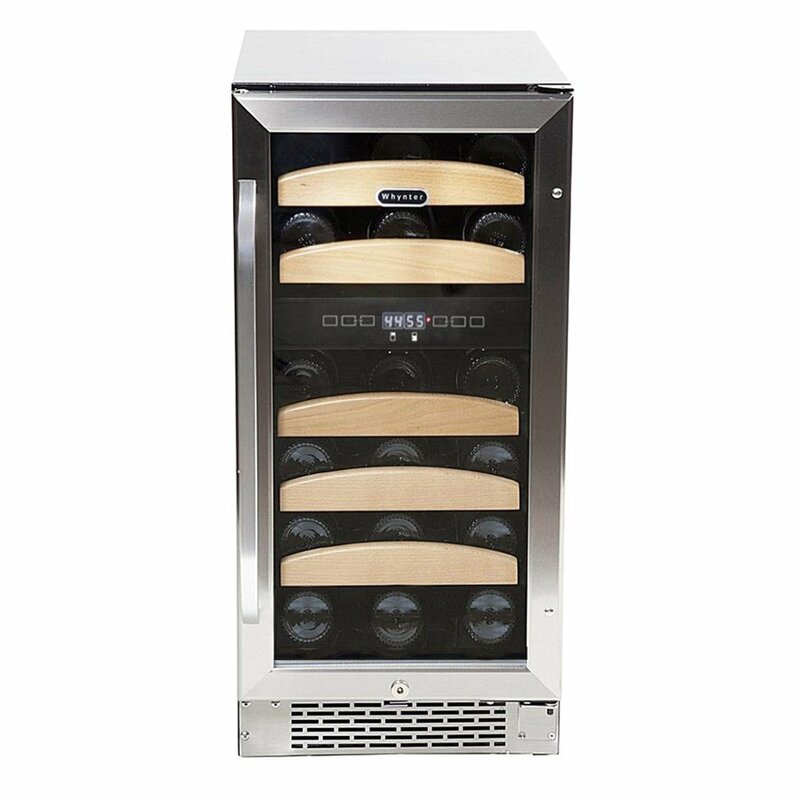 Koldfront brings you this very attractive wine cooler that has removable wooden shelves. Temperatures range from 54° to 66°F (12° to 18.9°C) for the red zone and 46° to 66°F (8° to 18.9° C) for the white zone. It includes an LCD display to control the temperatures and an inner LED light to illuminate your bottles. 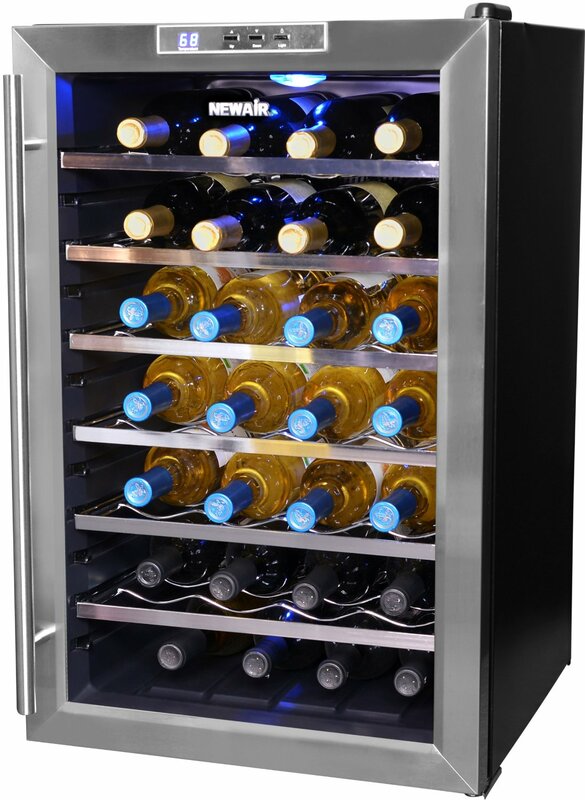 The Koldfront24-bottle wine cooler costs approximately $260. 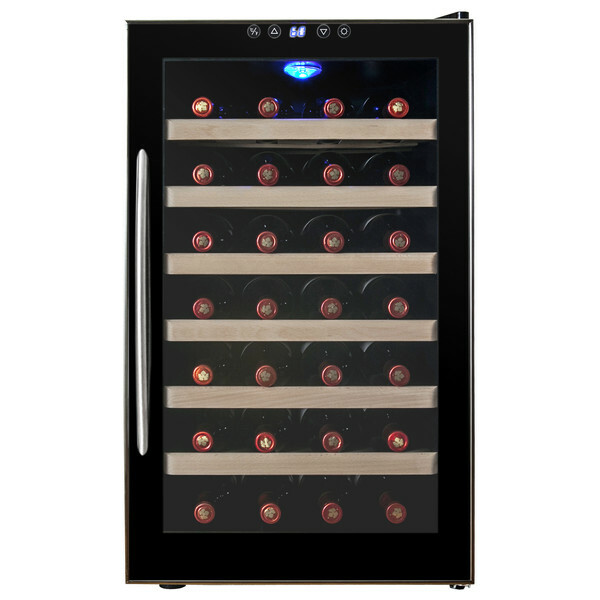 This very affordable option from AKDY leaves your wine bottles looking very organized in the LED-illuminated interior. Its six removable wire racks give you the choice to include a row of oversized bottles that wouldn’t normally fit with all of the shelves in place. The wire racks help reflect the blue LED light. It also features an LED touch screen for temperature adjustment. Its quiet-running thermoelectric cooling system protects your wine from harmful vibrations that some non-thermoelectric units may give off. The temperature inside ranges between 54°F – 66°F (12-18.9°C). The AKDY 28-bottle wine cooler keeps temperatures very accurately. It’s a great size for the kitchen, and guests will definitely appreciate the variety of wine that this cooler so easily displays. It costs about $200 and comes with a one-year manufacturer’s warranty. The NewAir AW-28 is a great value cooler. It features six easily removable chrome racks. If you want to fit a number of larger bottles, it’s easy to take out one of the racks. The cooler’s door is stainless steel-trimmed with double-paned glass, and there’s a panel at the top to control the temperature inside. The inside is lit up by a blue LED light located on top of the inside. It’s thermoelectric, so it runs quiet and vibration-free. With four inches of clearance on all sides, this cooler does a very good job of keeping the temperature where it should be. The adjustable temperature can be set to anywhere between 54°F – 66°F (12-18.9°C). 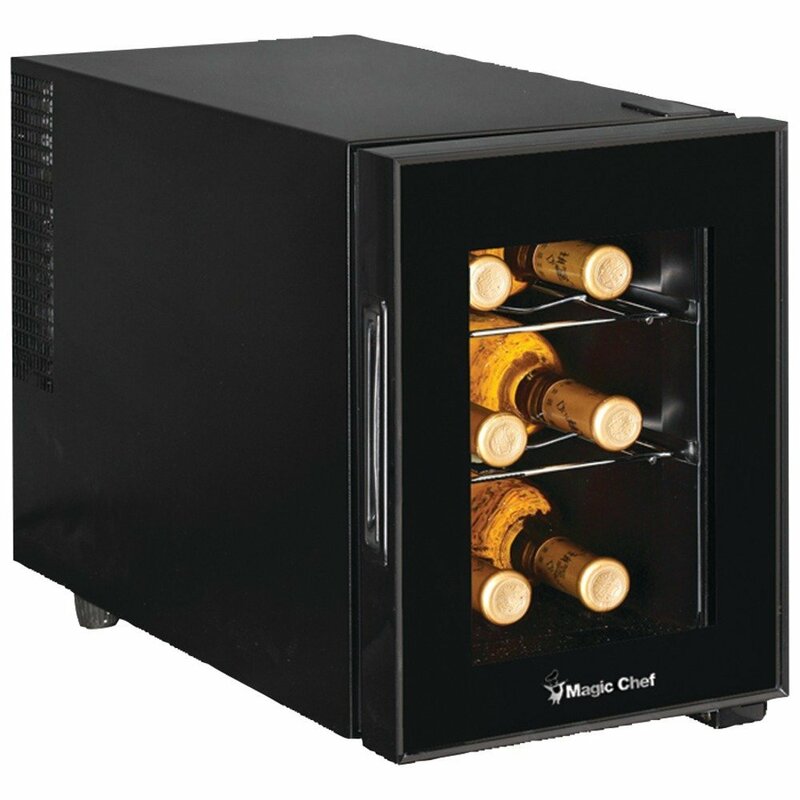 The main reason this wine cooler is really good is because it works great even though it’s cheap. It happens to look good too. The NewAir 28-bottle cooler goes for around $260. That’s a great deal for a wine cooler of that capacity. This great looking wine cooler has a unique design that makes it stand out from the pack. Its five wooden shelves have a rounded shape that resembles a drawer. There is space at the bottom for three more, larger bottles. Temperatures range from 41-50°F (5-10°C) for whites and 50-72°F (10.-22.2°C) for reds. 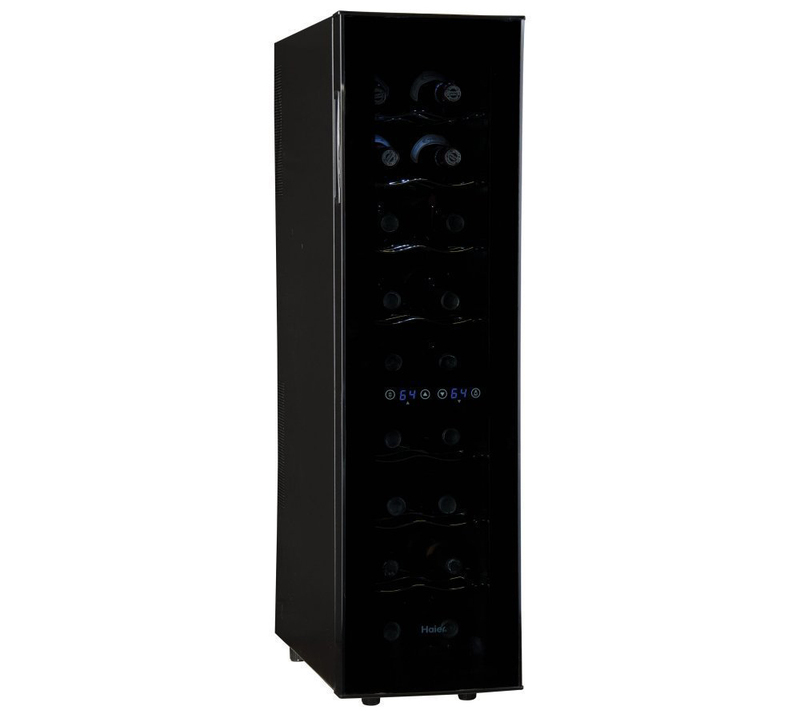 The Whynter 28-bottle wine cooler retails for about $520. 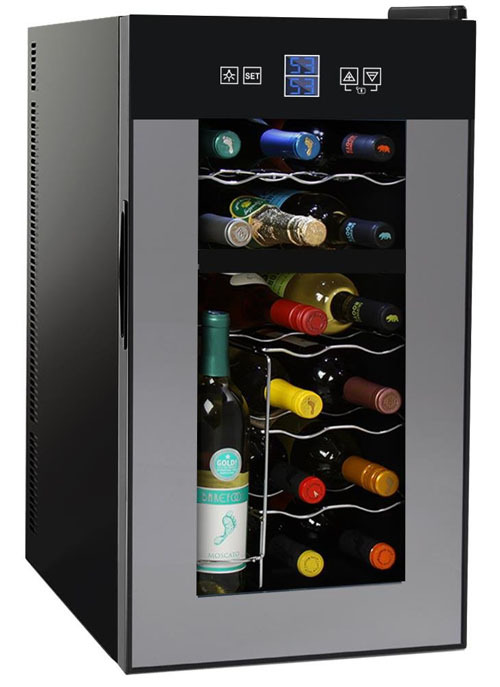 Wine Enthusiast’s 32-bottle dual zone wine cooler runs very quietly. It’s got a sleek black design that blends in well with your kitchen or at-home bar. Temperatures range between 46-66°F (8-18.9°C) and 54-66°F (12.-18.9°C) for whites and reds respectively. Both zones have a capacity of 16 bottles. This wine cooler is freestanding, so you can’t install it into your counter. It has a blue LED light on the inside to help you see the labels of your wines. Its shelves hold 32 standard bottles and can be removed to accommodate bigger bottles. The door is somewhat fragile, but as long as you’re careful with it, it should be just fine. For a price around $360, this cooler is a great mid-range option. If you’re looking for something smaller with a more modest capacity, this 12-bottle option from Nutrichef is a great pick. It’s thermoelectric, so you can be sure it’ll be quiet-running and have limited vibrations. Since it only fits 12 bottles, it’s quite compact at 2 bottles wide and 6 high. It can be squeezed into tight spaces quite easily whether that’s on your counter top or in between your refrigerator and the wall. It ventilates from the back though, so leave three or four inches between it and the wall. If you have a large wine collection but like having bottles handy in your dining room or even living room, this could be a second cooler for storing bottles you intend to drink sooner rather than later. Or if you have a limited collection, this could keep your prized bottles at the right temperature for as long as you need. It’s backed by a one-year warranty and is built to last. For an even smaller option than the 12-bottle capacity Nutrichef, this 6-bottle unit from Magic Chef is as compact as they come. This size is perfect for keeping just a handful of bottles on hand beside your dining room table, or anywhere else. Considering its extremely compact size, it’s easily portable, and can be taken from place to place or moved from one room to another with very little effort. This type of cooler is also perfect if you have a large collection of reds, for example, and only a few whites. You wouldn’t need to buy a very large dual zone cooler, which would have the half designed for whites nearly empty most of the time. Your large collection of reds could go in larger, separate cooler altogether. Basic yet sleek and well-designed, this dependable cooler is highly rated and should be a solid choice for anyone who needs something in this size. For people who want a good balance between having a relatively small unit and a reasonable amount of storage space, 18-bottle capacity is a very good option. It won’t accommodate a fast-growing collection, but if you plan on keeping roughly the same amount of bottles stored for years to come, then this is a very nice choice. It comes in either black or a super sleek stainless steel, and has two distinct zones for collectors of more than one type of wine. It includes vertical shelves that help preserve the flavor and quality of already opened bottles of wine. Overall, this is a very fine cooler than would look great in any kitchen or dining area.